Sgt. 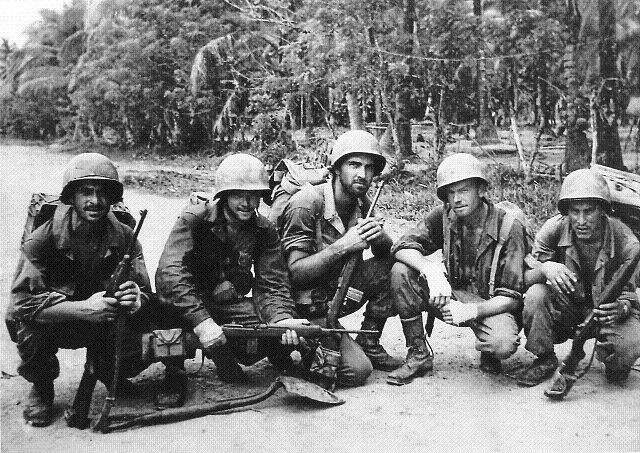 Bud Epling, center, poses with fellow members of the 1st Cavalry Division on Luzon Island, Philippines, at the end of a 19-day mission during World War II. Epling, a La Plata County resident, died of cancer in July at age 91. “I’ll do what I have to do,” Walter (Bud) Epling said in April. The pain in his side nagged, but it was bearable, so he cleaned ditches and burned weeds and irrigated fields as he’d always done. The work distracted him. He thought the pain would go away if he ignored it, but it didn’t. Sleep became elusive, food distasteful. He lost weight and became short of breath. X-rays showed a shadowy accumulation of fluid around one lung. “We’ll drain it next week,” the doctor said, but it was postponed because of another patient’s emergency and then postponed again. Perhaps the doctor took his time, knowing the news would be bad, treatment options limited, a cure impossible. He spent hours on the phone making appointments, transferring records and finding a place to stay, but nothing came of it. A specialist said nothing works against this kind of cancer. There isn’t any treatment. “Do you have any questions? Do you want me to explain anything?” I asked, wanting to help, wishing I had as many answers as the medical diploma hanging on my wall implied. The fluid built up, was drained and built up again. Bud’s chest lining wept fluid as the cancer clawed at it, and every breath rubbed against a searing rawness. The pain worsened before each drainage and ebbed slowly afterward as his lung expanded. “I didn’t think I could hardly stand it,” Bud said, but he did. He did what he had to do. Bud also did what he had to do in the Pacific Theater during World War II. He marched with the 1st Cavalry’s armored “Flying Column” to free Allied internees in Manila. As a forward observer, he crawled through enemy-held jungle, spying on Japanese positions. He radioed target coordinates to the artillery. He earned a bronze star. Fourteen thousand American soldiers died retaking the Philippines; almost 50,000 were wounded. We call theirs the Greatest Generation because Bud and his fellow soldiers saved the free world. When Bud came home after three years without a furlough, he didn’t talk about it. He raised a family; hunted, fished and farmed; worked for the telephone company; then started a business and repaired satellite dishes into his 80s. He kept his health and strength until he was 91. Last fall, he took his two older sons elk hunting at my cabin near Dallas Divide. “Well, I filled my tag,” he said when he called. They got two and could have had another. The place was crawling with elk, Bud said, but by the time those two were dressed and quartered, he was pretty tired. No kidding: two elk, 9,000 feet, 91 years old. “Dad took charge of everything – the old first sergeant,” son Bob said. Every year, Bud attended a reunion of his outfit (C Battery, 99th Field Artillery Battalion of the 1st Cavalry Division) hosted somewhere in the country by one of the veterans’ families. Each year, fewer veterans were able to make the trip, and in 2009, there were only two. Children and grandchildren of the other soldiers came, though, and they wanted to continue the tradition, so Bud volunteered to host the reunion in 2010. It would take some planning, but he’d show them Southwest Colorado’s Alpine Loop, Mesa Verde and the Durango & Silverton Narrow Gauge Railroad and impress those flatlanders with some real mountains. It would make for a busy year, but he’d also find time to fly to Washington, D.C., to pay his respects at the World War II Memorial. He’d looked into the free flights for veterans and thought maybe he could push a wheelchair or in some other way help an old soldier less fit than he was. He’d go in May, he decided, but cancer intervened. For the last time, Bud did what he had to do and fought the fight and bore the pain and tried to make it as easy for his family as he could. “He’s just so tough,” said his wife, Dorothy. All the soldiers of the Greatest Generation were tough. Too many of them died in combat, and of those who survived, too few enjoyed the health and length of life Bud had, so it almost seems wrong to wish for more, but I do. I wish he could have seen the memorial, hosted the reunion and shot another elk, but in July, the cancer won. My friend Bud Epling, the old first sergeant of C Battery, is gone. husercj@co.laplata.co.us Dr. Carol J. Huser, a forensic pathologist, has served as La Plata County coroner since January 2003.